When Gracejean Hennigar established the Learning Skills Program in 1983, it was the first of its kind at a Virginia boarding school. Gracejean was ahead of her time and knew that students with learning disabilities and learning differences could receive the support they need, without stigma, while fully integrating into the school's curriculum, including honors classes. She knew that they could be student leaders, team captains, stars of the show ... anything they could dream of ... and graduate as confident and independent learners. In 2015 I had the honor of joining Gracejean on the LSP staff. I spent two years working with her before assuming leadership for the program when she retired. It is my privilege to carry on the success of this program. I would love to meet you and your child. Please call 804.758.2306 ext. 122 today to make an appointment. I am confident that we can work together with your child toward confidence and independence. "The magic of the Learning Skills Program ... is that they will see what we are able to see..."
Learning Skills Program at Christchurch School from Christchurch School on Vimeo. At Christchurch School, approximately 25% of the student population is enrolled in our Learning Skills Program (LSP). Our Learning Center is centrally located on campus and is connected to all aspects of school life as a valuable resource center for both students and faculty. Services are customized and tailored to each student’s needs. LSP supports the success of nontraditional learners and allows them to thrive in a hands-on learning environment focused on skill acquisition. LSP takes a holistic approach to support students with learning differences and those with diagnosed learning disabilities such as Attention Deficit Disorder (ADD), Attention Deficit Hyperactive Disorder (ADHD), anxiety, executive function weaknesses, processing speed and working memory deficits, Dyslexia, and a range of other learning differences. The hallmark of our program is that we do not see the diagnosis or difference as a deficit, but rather as a representation of the variability of learners with great potential. LSP helps students recognize, identify, and develop strengths to circumvent weaknesses. LSP provides comprehensive learning support and promotes the academic success of students through relationships, while also offering the support of assistive technology, such as Learning Ally, to promote the study skills and independence that each student will need to succeed in high school, college, and beyond. We teach time and materials management, metacognitive strategies, goal setting, and leadership skills so that students can thrive in any future endeavor they envision. We work to promote the reading comprehension and note-taking skills with which students who have executive functioning weaknesses and language-based learning differences struggle. We provide subject-specific support in all content areas to fill gaps in academic proficiency and prepare students for the challenges they face both inside and outside of the classroom. Our ultimate goal is to develop independence and confidence to ensure that each LSP student thrives as they transition into the next chapter of their academic and personal lives. Christchurch School employs five full-time LSP instructors who are dedicated to promoting the mission of the program. All LSP instructors have classroom teaching experience in history, science, math, and Spanish and utilize their experience to provide unique, subject-specific support during each LSP class. They are specifically trained to work with a range of learning differences and disabilities including ADD, ADHD, Dyslexia, and executive functioning weaknesses. 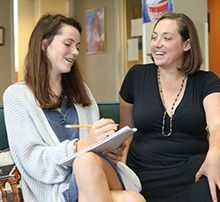 Our faculty, coaches, and dorm parents all work closely with LSP to help students thrive in mainstream and advanced classroom environments, and also to ensure that each student’s learning and living experience is maximized. LSP faculty are adept at coaching our non-LSP teachers in how to best support students with learning differences or disabilities. LSP instructors also regularly attend classes across the curriculum to better understand the student experience. ADHD (Inattentive,Hyperactive-impulsive, or combined); Dyslexia or other language-based Learning Disabilities (LBLD); Specific Learning Disorders (SLD in reading, mathematics or written expression); Executive Function weaknesses; Processing Speed deficits; Working Memory deficits.